SEOUL, Feb. 21 (Yonhap) -- A court on Thursday handed down a six-year prison term to a former senior secretary to President Moon Jae-in over a corruption case related to a gaming industry body, and one year in jail, suspended for two years, for abuse of power. Jun Byung-hun, an ex-presidential aide for political affairs and a former lawmaker, has been suspected of forcing two home shopping channels -- Lotte Home Shopping and GS Home Shopping -- and telecom company KT to donate 550 million won (US$514,260) between 2014 and 2017 to the Korea e-Sports Association, over which he practically held control. But he was not taken into custody after the ruling. The court did not issue a warrant to arrest him as it judged that "it is appropriate for him to appeal to a higher court and solve the dispute (with the prosecution) without detention." "His criminal responsibility is grave," the court said in its verdict, adding that Jun damaged the fairness and integrity of parliament by accepting bribes from companies related to his parliamentary activities. The court dismissed him on charges of receiving 250 million won in bribes from GS and KT, but ruled he accepted a bribe of 300 million won from Lotte. According to Thursday's ruling, Jun abused his power and interfered with the exercise of a right by pressuring the ministry to have the budget allocated. The court also found Jun guilty of misusing funds to pay for his wife's travel expenses and his staffers' wages with money of the industrial body and accepting illegal political funds worth 20 million won. One of Jun's aides, identified only by his surname Yoon, was sentenced to five years in jail and a fine of 500 million won for colluding with Jun to demand the companies donate the money. Yoon was released on bail, but the court canceled his release. 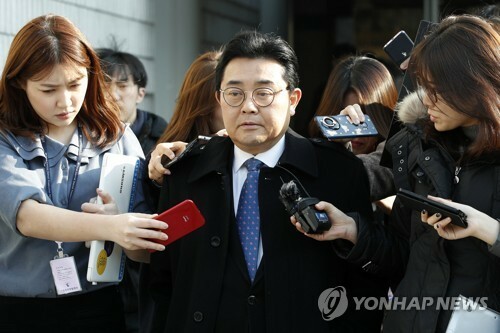 The court sentenced Kang Hyeon-gu, former chief of Lotte Home Shopping, to 1 1/2 years in jail, suspended for two years, for giving the bribe to Jun. After the ruling, Jun said he will appeal the decision, saying, "It's mortifying. The court seemed to accept the results of the prosecution's unreasonable investigation into the case." Prosecutors sought an arrest warrant for Jun twice in November and December 2017, but they were turned down both times by the court, which cited disputable grounds for the charges.